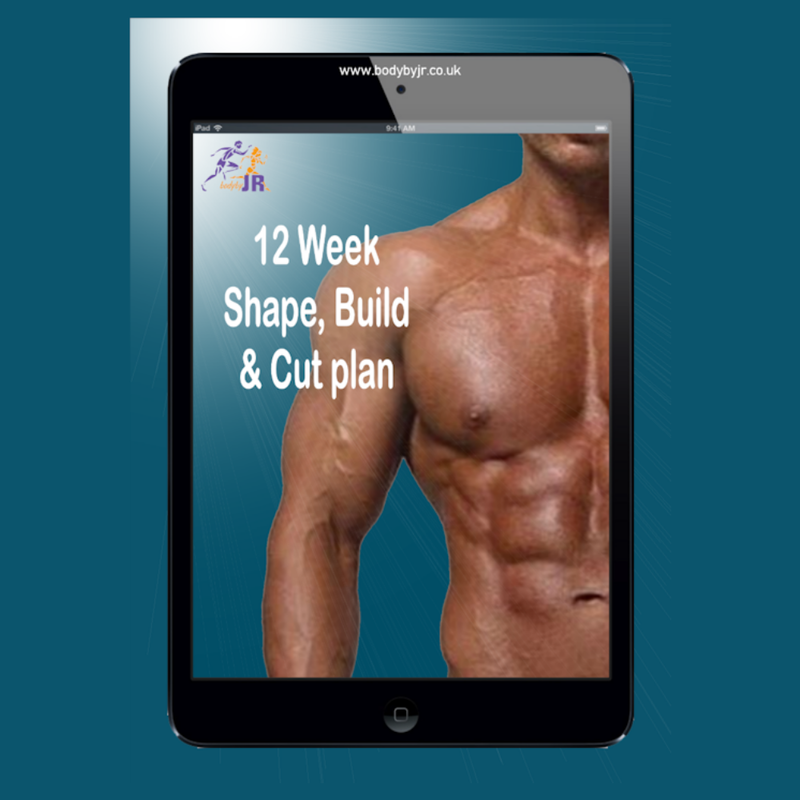 The BodyByJR 12 WEEK SHAPE, BUILD & CUT PLAN can be purchased online and downloaded for just £79.99.  unsure of what to eat or how much?  possess a passion to transform your body?  have a goal date in 12 x weeks’ time / want a Summer body?  want to lose fat and build muscle?  are able to eat frequently throughout the day whilst at work?  can have the time to train for up to 1.5 hours daily / 6 x weekly in the later stages of the plan?  aspire to learn how to train with intensity and how to apply vast training techniques? If you’ve answered yes to any of these points then this plan could be for you! BodyByJR 12 Week Shape Build & Cut Plan – Want to know more? BUILD – PHASE TWO – increases in food volume and frequency to assist with muscle growth (as a result, body fat reduction may not be so apparent). In addition, training will increase in volume and frequency. CUT – PHASE THREE – reduction in food and eventually a carbohydrate cycling plan to strip away remaining body fat. The alteration of carbohydrate intake will prevent a fat loss plateau and will maintain metabolic rate and workout performance. Due to this method being quite aggressive, it is very effective but must remain short term.